Result : Before 5th June, 2018. ** JEXPO & VOCLET Admit Card 2018 has been released on 30th April 2018. JEXPO is a joint entrance examination for polytechnic courses. ** It is organized by the West Bengal State Council of Technical Education. It is a state level entrance exam which is also known as WB Polytechnic. ** The admit card can be downloaded through the online mode as per the scheduled dates only.Candidates will have to carry the admit card along with a valid photo ID proof at the commencement of the examination. Candidates go to visit the official website of WBSCTE and search for the link to the admit card on the homepage. Click on “Admit Card of JEXPO / VOCLET 2018” Tab. Download Page will be opened. 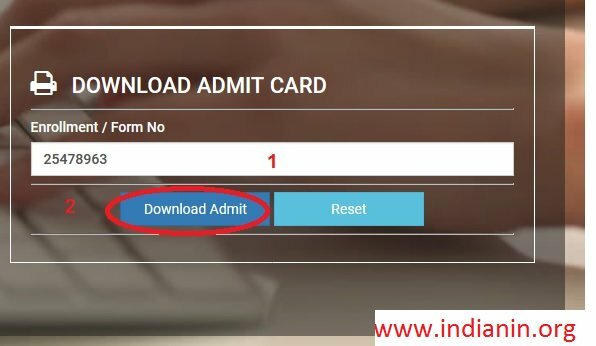 Step 2 : Click “Download Admit” button the admit card will be displayed on the screen. Candidates need to check all the details mentioned on the admit card. After verifying all the details, the candidates will have to download the admit card and take a printout for the future reference. ** The e-Admit Card will contain name & address of the Examination Centre for JEXPO–2018 & VOCLET – 2018along with other details. ** No Admit Card will be sent to the applicants appearing for VOCLET–2018 & JEXPO – 2018. ** Candidates must retain/preserve their e–Admit Cards carefully till completion of the admission process for the academic session 2018-2019. Latest revised syllabus on Mathematics and Physical Science upto Class X under West Bengal Board of Secondary Education (WBBSE) shall be followed for JEXPO–2018. Theorems on concurrence, Area of circular region, Co-ordinate Geometry – Internal and External Division of Straight Line Segment, Co-ordinate Geometry – Area of Triangular Region, Logarithm. Measurement, Force & Motion, Atomic Structure, Mole Concept, Matter – Structure and Properties, Solution, Acids, Bases & Salts, Work, Power & Energy, Sound, Heat, Separation of Components of Mixtures, Water. The latest revised syllabus of West Bengal State Council of Technical and Vocational Education and Skill Development (Vocational Education Division) [erstwhile, West Bengal State Council of Vocational Education & Training] for (10+2) examination shall be followed for VOCLET-2018. Laws of Indices, Complex Numbers, Algebra of Complex Numbers, cube roots of unity and its properties, D-Moivre’s Theorem. simple problems.Sequence And Series: A.P., G.P.Quadratic Equations. Solutions of Quadratic Equation in complex number system. Binomial Th, de?? nition of permutation – combination with formulae, Binomial Theorem for positive integral index, general term, middle term. Matrix. Determinant, Cramer’s rule [unique solution]. Function, identity polynomial, rational, modulus and signum functions with their graphs even, odd, periodic and parametric functions. Differential calculus, limit and continuity, differentiation of parametric, logarithmetic and implicit functions.Successive differentiation upto 2nd order problems. addition of vectors, dot product, cross product position vector of a point dividing a line segment in a given ratio. Units of measurement; Dimension of physical quantities, Motion in a straight line; de?? nitions, Graphical analysis. Equations of motions. Scalar and vector quantities, Scalar and vector products of vectors. Frame of reference Newton’s laws. Law of conservation of linear momentum. Friction, Uniform circular motion; vehicle on level circular road / banked road. Chemical industries. Chemical Equation,Percentage composition, empirical formula, molecular formula, Problems. Concept of Engineering Mechanics: Statics & Dynamics, Scalar quantity, Vector quantity, Addition & subtraction of Vectors. Introduction to Computer Systems: Definition, Evolution, Generations, Computer Systems, Computer Organization, Input Devices, Output Devices, Computer Memory, Number Systems and Computer Codes. (i) Candidates must enter the examination hall 30 minutes before the start of the examination. (ii) Candidates must bring with them the downloaded e-Admit Card along with an original Photo Identity card, like Aadhaar Card / Admit Card or Certificate of Madhyamik or equivalent examination which contain the photograph / Voter Identity Card / Driving Licence / PAN Card / Passport / Bank Passbook which contain the photograph or any other photo identity card issued by the Competent Government Authority to prove their identity. (iii)Candidates must bring Blue/Black Ball-point pen. (iv)Rough work or any other type of writing should not be done on the OMR Answer Sheet. Question Paper may be used for the purpose of rough work.